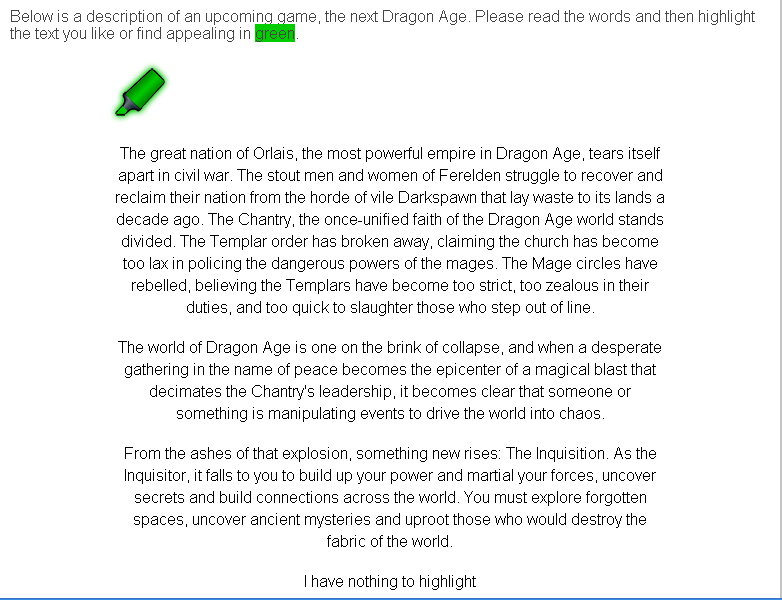 Dragon Age 3 Plot Synopsis and Companions Leaked? The great nation of Orlais, the most powerful empire in Dragon Age, tears itself apart in civil war. The stout men and women of Ferelden struggle to recover and reclaim their nation from the horde of vile Darkspawn that lay waste to its lands a decade ago. The Chantry, the once-unified faith of the Dragon Age world stands divided. The Templar order has broken away, claiming the church has become too lax in policing the dangerous powers of the mages. The Mage circles have rebelled, believing the Templars have become too strict, too zealous in their duties, and too quick to slaughter those who step out of line. The world of Dragon Age is one on the brink of collapse, and when a desperate gathering in the name of peace becomes the epicenter of a magical blast that decimates the Chantry's leadership, it becomes clear that someone or something is manipulating events to drive the world into chaos. Dorian: Dorian Pavus is a magister. The title conjures fear of arcane masters who once enslaved nations. Dorian may wield power of the magisters, but he delights in not being what you’d expect of them. Brazen and clever, this outcast is on a crusade to rid his homeland of its corruption. Sera: Sera is young, frenetic, and a brat through and through. She revels in the athleticism of being an elf, of being different. But her culture isn’t elven, or, for that matter, strictly human. It’s the underbelly of the city. In her network of rogues, what you do is more important than where you’re from, and friends open more doors than [titles?]. Robs from the rich, keeps it. The Iron Bull: The Iron Bull is a long way from home, and prefers it taht way. A slap in the face of typically humorless Qunari, he loves drinking, killing, and looting-not necessarily in that order. The head of a vicious mercenary company, he’s known for excellent pay and brutal punishment. It’s been a ten year party, but the Bull may find that old loyalties die hard. Cole: A long time ago, a young man died a cruel death in a dark place. And now, somehow, there is Cole. Was he a spirit of a demon? Is he human now? Cole’s not sure it matters anymore. Hounded by memories that aren’t his, incisible in a world he can stalk like a shadow, the rogue must decide between joining the living or preying on them. There are 99 comments on Dragon Age 3 Plot Synopsis and Companions Leaked?